Corrosion Control Coatings can stop the development (or further development) of crevice corrosion and pack rust in joints and connections. Typical coatings leave steel vulnerable to micro-cracking, delaminating, rust leaking and perforations. Crevice corrosion and pack-rust can cause out-of-place bending and rust bleeding which can is serious cases cause structures to collapse. Using corrosion control coatings can actively penetrate corroded crevices and protect steel. Corrosion control coatings are used worldwide on a range of structures. They are environmentally safe and extremely cost effective. 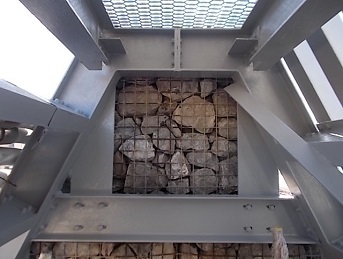 Typical applications include bridges and highway overpasses, bolted or plated steel assemblies, water towers and tanks, utility towers, flexible structures and most structural steel applications, specifically where crevice corrosion and pack rust between joints and connections proliferate. Like any coating system, the successful application will depend upon substrate preparation. For a corrosion control system to work it is important that all loose paint, loose rust and tightly adhered black oxides are removed. All soluble salts must be removed from the surface of the steel including chlorides, nitrates and sulfates. Corrosion control coatings are engineered exclusively for encapsulation (overcoat) of existing aged paints, or re-coating of new or prepared structural steel. The systems are generally recommended for above ground applications, but can be used on structures buried in soil such as buried pipes and utility towers following a specialist procedure. Cure times are dependent upon temperature. CSC Services can advise upon this. At an ambient temperature of about 24 degrees, with relative humidity @ 50%, drying time of a typical coating system will takes approximately 8 – 12 hours. The minimum temperature that the coating can be applied is 2 degrees. All colours are available, and CSC Services can order to suit. Corrosion control coating systems have a five year warranty and approximate twenty five year service life. CSC Services can now carry out repair and coatings work offsite. Structures, pipes or equipment of up to 3m wide can be forklifted in and out of the CSC Services specialist unit, and a range of coatings applied. CSC Services recently completed a job for Hartlepool Power Station to repair and coat Ferrous Sulphate Tank Lids and Steel Walkway gratings for EDF Energy. The tank lids and walkway gratings were transported from Hartlepool Power Station to the CSC Services work unit for the refurbishment work as part of a plant upgrade. A marine grade coating system was applied to protect against chloride attack at the coastal location of the power station. Read more about this project here. A corrosion control coating system was recently applied to the Gabion Wall at Hinkley Point B Power Station for EDF Energy. Marine exposure and high chloride ingress had taken its toll putting the integrity of the structure at risk. This corrosion control system was applied to prevent against rust creepage. The coating penetrates surfaces and will protect in ways that traditional coatings will not. It will protect against perforation from sand, stones and gravel.